Photos are of same specimen. Came to UV light. Moved to new species page. There are only three Furcula species listed as being in California in the California Moth Database: F. scolopendrina, F. nivea, and F. cinerea. The forewings on F. cinerea are more grey than on my specimen; F. nivea occurs only in southern CA (and doesn't look like my specimen, either), so that leaves F. scolopendrina which looks like a good match. 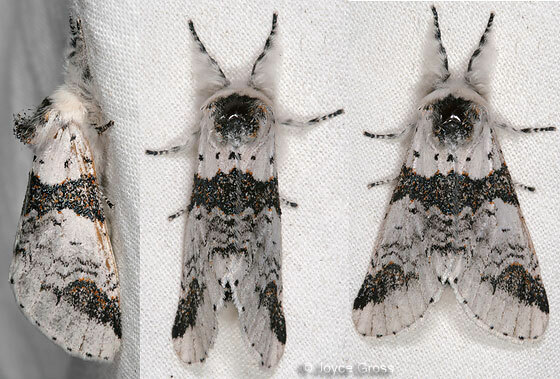 Furcula borealis - Hodges#7936. An interesting find!